Support for the Iraqi "resistance"
One way of defining "the left" is as the opponents of Western power and Western victory. People who do not identify with countries based on Western democratic values in their struggles against countries and groups based on Islamist, communist or other hostile values. At best they are indifferent. At worst they defend the enemy side. Here are some such groups in Ireland. I often write "anti-war" in inverted commas, since many of these organisations actually support wars and violence, such as the Palestinian jihad and even the Iraqi jihad. Anti-War, My Foot by Christopher Hitchens, 26 Sept 2005, pointing out the vast number of people at "anti-war" demos that support violence. I'm sure the majority would support the Palestinian resistance, for example. "It is really a disgrace that the liberal press refers to such enemies of liberalism as "antiwar" when in reality they are straight-out pro-war, but on the other side. Was there a single placard saying, "No to Jihad"? Of course not." 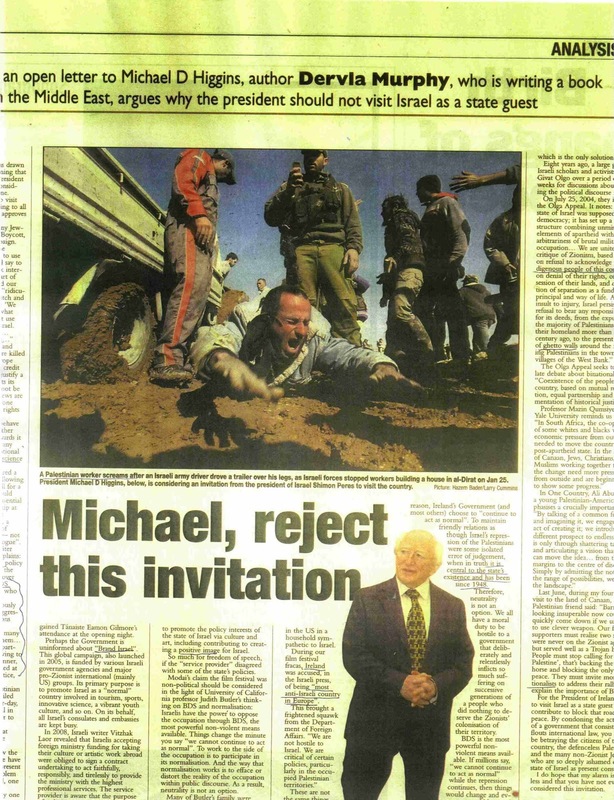 PANA is quoted in the Irish Times, Fri 25 June 2004, as supporting the Iraqi jihad. PANA's spokesman Roger Cole is quoted by the Irish Times as follows: "He views Iraqi resistance to occupation as a legitimate independence struggle, similar to the Irish and, indeed, American wars of independence." If this quote is accurate, then PANA are not anti-war. They are pro-the other side. You would think, though, that even if they supported the goals of the fascist resistance (an Islamist tyranny, cleansed of infidels), that they would at least complain about the fact that the resistance was violent. What is the Iraqi "resistance"? The "anti-war" group PANA opposes the disarming of Hezbollah, Aug 2006: "The resolution's call for the International Force to be used to prevent the resistance in Lebanon from rearming is recipe for possible future military conflict between UN forces and the resistance. ... PANA believes that an Irish Army that was formed as a consequence of a national war of resistance against an army of occupation has no role in a war against a national resistance movement." When the IAWM planned to bring Hezbollah to Ireland in 2006, "Anti-War" Ireland defended them. Fintan Lane of Anti-War Ireland is quoted as saying: "My personal political position (as a non-pacifist) is that Hezbullah and any other Lebanese group were perfectly entitled to defend their country against Israeli aggression. I would also be understanding of actions taken in defence of Palestinians." The all-too-common sympathy for violence - so long as it is violence by jihadis, not by democracies. As there were signs of victory with the surge in Iraq in 2007, Brendan Butler of the NGO Alliance seemed to hope against hope it is not true, letter, 17 Oct 2007. From his wealthy Dublin suburb he sneers: "Four-and-a-half years ago ... an elated George Bush, standing aboard the US aircraft carrier Abraham Lincoln,' declared that "major combat operations have ended in Iraq". How many more years of infrastructural devastation and deaths of innocent Iraqi civilians are needed before the US administration realises that the Iraqi "war" is unwinnable?" Tony Allwright gives him what he deserves: "As the millionth brave American soldier passes through Shannon, you can almost taste the despair in Brendan Butler's letter .. on having read some rare positive tidings from Iraq, namely that Al Qaeda seems to be on the retreat ... Harking back to George Bush's (in)famous visit in 2003 to an aircraft-carrier which flew a banner saying "Mission Accomplished", he writes as if he fervently hopes that the latest good news will be similarly confounded, infrastructure further destroyed, civilian deaths continue, the war remain unwinnable." South Dublin City Anti War Group (or via here) claims to be "against all wars". But bizarrely, prominent among their "Friends" list on their front page is the violent, pro-war group Sinn Fein - IRA, who have killed over 1,500 people, and are still killing today. Only against some wars, it seems. Rev. Patrick Comerford, Church of Ireland cleric, President of Irish CND. John de Courcy Ireland, founding member of Irish CND, was involved with the Communist Party of Ireland, the Workers Party and the SWP, all of whom openly supported violent foreign tyranny. UK CND is headed by Kate Hudson of the Communist Party of Britain. The Iranian ambassador was guest of honour at 2005 CND annual conference. Hey, if you can't beat them, join them. Using their own definitions, I'm "anti-war" myself! I totally support the war being waged by the heroic freedom fighters of the American military, of course. But I am completely opposed to the violent illegal war being waged by the fascist warmongering Iraqi resistance. The Iraqi resistance should stop, and all foreign jihadis get out of Iraq. Their violence is the root cause of the conflict. If they stopped, there would be peace. So I'm anti-war too! Stop the war! Stop the jihad! Iran, Syria and Saudi Arabia out of Iraq now! End the Islamist violence against infidels! Stop the jihad in Iraq and Palestine! The Catholic Worker Movement - Religion and socialism. Two bad ideas in one! By their own admission: "five members of the pacifist Catholic Worker movement made their way into Shannon Airport and non-violently disarmed a U.S. navy war plane in the early hours of February 3rd. 2003." And yet they were acquitted by the jury - on the grounds that they had a lawful reason to damage property. This gives a green light, for example, to any jihadist or fellow traveller to attack US military equipment in Ireland. A shameful day for Ireland. The law must be changed, so that juries cannot make politicised decisions like this, completely outside democratic control. I do not see how what they did is any different from saboteurs attacking allied equipment before D-Day. German agents in America and Canada carried out a number of successful sabotage missions in WW1. The largest was the Black Tom explosion of American munition supplies in New Jersey in 1916. German Sabotage Against the United States in World War II was almost entirely unsuccessful. Operation Pastorius was the failed Nazi sabotage attack on the United States in 1942. Acquitted saboteur, Australian Ciaron O'Reilly, has many convictions for attacks on the military of free countries. Oddly enough, I can't find any attacks by him on the military of dictatorships. If you know of any, let me know. The anti-Israel Derry Anti-War Coalition destroy offices of US defence company Raytheon, Derry, NI, Aug 2006. "thousands of documents and dozens of computers were burned and thrown from windows by members of a group that entered at 8am." They were probably encouraged by the Pitstop Ploughshares verdict, which gave the green light to this kind of violence. Leading this attack on the allied military was SWP moonbat Eamonn McCann. Every argument he makes could be made against the allied military in WW2. Why he thinks he is morally different from a saboteur in WW2 I don't know. The IAWM supports the sabotage, and describes Israel as "a rogue state". Eoin Dubsky supports the sabotage (and here and here). Labour Youth supports the sabotage. Eoin Dubsky approvingly quotes John Pilger's description of the Iraqi fascist "resistance" as "nationalists defending their homeland". This is the "resistance" that suicide bombs men, women and children in the street, at mosques and at religious processions. It has bombed Shiite Muslim mosques and Christian churches. It kidnaps, tortures and beheads innocent civilians - including journalists and aid workers. It kidnapped and executed the innocent Ken Bigley. It kidnapped and executed the anti-war, lifelong charity worker Margaret Hassan. It has bombed the Red Cross and the United Nations. It seeks to establish an Islamofascist state with no free speech, no freedom of religion, no human rights and no elections. It has no mandate and no popular support. Most Iraqis hate the "resistance" and want to see it destroyed. Why the left would support such people is not hard to believe. The left has a long history of support for tyrants. No, the mystery is how people who describe themselves as "anti-war" and "peace" campaigners could support violent people. So here is my question for Dubsky and Pilger: Even if you support the goals of the fascist resistance (an Islamist tyranny, cleansed of infidels), why don't you at least complain about the fact that the resistance is violent? The IRA in World War Two here are angry that Ireland is not being neutral enough in the war on Nazism. Just like the modern-day moral fools angry that Ireland is not being neutral enough in the war on Islamism. 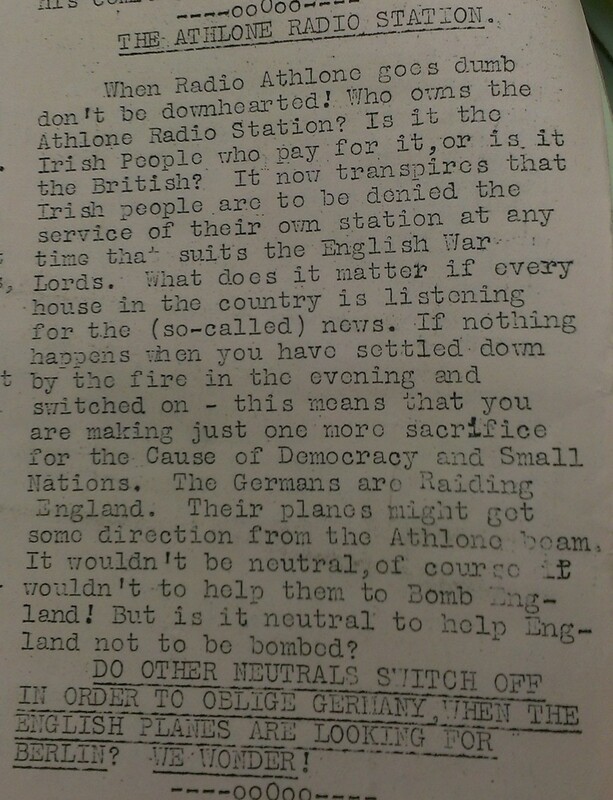 From the IRA's War News, 2 Dec 1939. Eoin Dubsky, Feb 2006, says that by Ireland allowing America to use our airports and airspace, "we've surrendered any possible moral defence against countries or terrorists who may attack us to prevent further military and CIA flights through Ireland". Again, for someone who is meant to be "anti-war", Dubsky is remarkably non-judgemental about violence by other people. Surely the Islamofascists wishing to prevent military and CIA flights through Ireland should use protest, diplomacy and sanctions first, instead of heading straight to violent terrorism against our women and children? Dubsky's non-judgemental comments about Islamist violence show a common failing of "anti-war" groups in the West. Obviously, I think they have ignorant, naive political ideas which will lead to the triumph of tyranny, fascism, genocide and (yes) war worldwide. But perhaps my main criticism of them is simply their name. They're not anti-"war". If they were, they would be furious at the violent Iraqi resistance, the violent Palestinian intifada, Iran's violent threats to Israel, and violent Islamist terror in general. But such fury is usually hard to detect. They're not anti-"war". They're anti-America. It's easier for me. I make no claims to be anti-war. I support the military operations of America, Britain and Israel. I wish their military luck in defeating and killing Islamist fighters worldwide. I wish for victory for free countries like Israel, and defeat for tyrannies like Iran. My philosophy is consistent, even if you disagree with it. Unlike the "anti-war" people, I am not inconsistent or hypocritical. Iraqi civilians killed (all deliberately) in 2006 by the Iraqi resistance: 16,791. Iraqi civilians killed (all accidentally) in 2006 by Americans: 225. In other words, the incredibly careful and skilled Americans have hardly killed anyone innocent since 2003, and those that have died have all been killed accidentally while engaged in street warfare with jihadis. Almost all the deaths in Iraq are at the hands of the resistance, not at the hands of the Americans. As Glen Reinsford says: "Iraqis aren't dying from war. They are being murdered by Islamic terrorists." The Irish left's support for the Iraqi fascist "resistance"
The left's support for the Iraqi fascist "resistance"
"We thank all those, including those of Britain and the U.S., who took to the streets in protest against this war and against Globalism. We also thank France, Germany and other states for their position, which least to say are considered wise and balanced, til now." Are the "anti-war" protesters proud? Remember these are incredibly violent people that are thanking you. Even if you agree with their goals, these are violent, pro-war people. Shouldn't that disturb you at all? Interesting how the jihadi thug considers the anti-globalisation struggle as part of the same struggle for tyranny and against freedom worldwide. Which of course it is. The UCD "Anti-War" Group says (Feb 01, 2006): "We express our solidarity with all democratic, secular and progressive opposition forces in Iraq fighting for US-UK defeat." Given that this "fighting" involves not parliamentary rhetoric or civil disobedience (why not?) but rather actual, literal fighting, that is, violence, including the suicide bombing of mosques and crowds of women and children, it seems amazing that the UCD "Anti-War" Group did not mention this. We only support those Iraqis who resist the US occupation through peaceful means. We condemn the disgusting acts of those who resist the US through violence. Does the UCD "Anti-War" Group support the violent Iraqi resistance? If not, please issue such a disclaimer, condemning the violent Iraqi resistance, and apologising for the ambiguity. Tell me about it, and I will happily link to it. "Anarchists" who hate capitalism. I find anti-globalisation, anti-capitalist "anarchists" baffling. How could an anarchist hate capitalism?? How could an anarchist want to take away economic freedom and set up a totalitarian collectivist government? The answer is they're not anarchists, of course. They're socialists. In fact, they say so on the page. Without any introduction at all they start talking about: "bringing socialism about". So why don't they call themselves socialists (or, more accurately, totalitarian communists)? "Anarchist" sounds cooler, I guess, to the daft young people who fall for this stuff. Irish "libertarians" who, strangely, hate capitalism, America and NATO. Baffling. How could a libertarian hate capitalism and America?? The answer is, of course, they're not libertarians. I am a libertarian. They are totalitarian communists. And of course, there are plenty of open, honest enemies of the west in Ireland in the form of socialists and communists, still going and unashamed after 100 million dead. Or "Nazimedia", as the right calls it, for its hatred of Israel. Open support for Islamofascist torture and killing on Indymedia, Apr 2004 (after the Fallujah mutilations). Again, the "anti-war" mask slips for the hard left. They support war (as I do). They're just on the other side. For some reason they support fascism rather than democracy. Indymedia Ireland, 2 July 2011, carries a press release from the terrorist group the PFLP. The PFLP stabbed 3 small Jewish children to death in Mar 2011. And now here is Indymedia Ireland carrying statements from them. "The Cancer of Western Civilization" by Luke Eastwood. This ludicrous piece of 22 January 2012 sums up the world of Indymedia Ireland. Apparently the entire last 5,000 years was a mistake, and we need to go back to a time before towns and cities. Pol Pot tried that, but apparently this guy will do it right. I love how he can't understand "why such an obviously flawed system has become almost omnipresent". And yet he is writing this on .. a computer! Where does he think computers come from, if not from Western capitalist civilization? In fact, he actually opposes civilization, not just western civilization: "after over 5000 years of expanding basically the same system of urbanized living, it is time to realize that this model of living is unsustainable, ... The only human societies that have managed to sustain themselves in-situ for very long periods of time are the most simple ones - such as those of the native North Americans, the Australian Aborigines, the Arctic peoples and African Bushmen. Most of these societies are, or are becoming westernized and abandoning their sustainable, subsistence lifestyles ... Obviously it would be impossible for the whole world to instantly return to a subsistence, agrarian lifestyle, however ... our planet will be killed if our reckless western civilization continues to expand unchecked." As Gates of Vienna says: "you can bet that the bulldozer and the pistol will be the last technological artifacts to be given up". Open support for the executed Libyan dictator Gaddafi on Indymedia Ireland, October 23, 2012. A paper given at the First Annual Colonel Muammar al-Gaddafi Day School in Dublin. The what?? This was not a fringe post either. As at Nov 2012, this was a feature post on the Indymedia front page. Tommy Donnellan (or "planxtysumoud") is a west of Ireland anti-Israel activist. Here is a video in which he openly supports violence against Israel. Indymedia Ireland glorifies the jihadist killer of Jew civilian settlers. 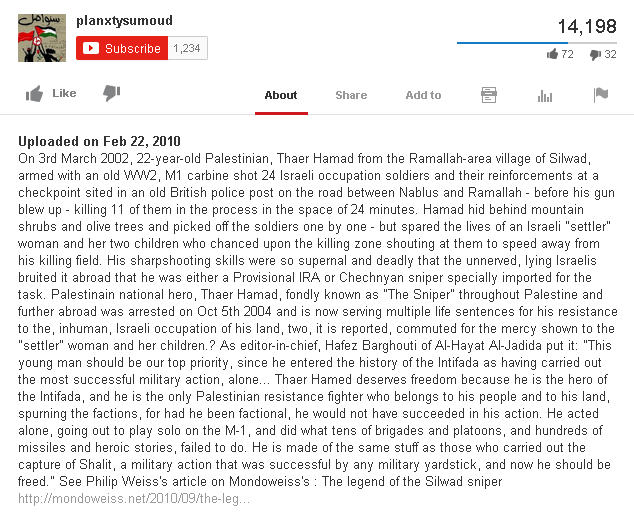 "Sniper Killer of 11 Israeli Soldiers: Thaer Hamad's Father Video Interviewed", Indymedia Ireland, 23 Feb 2010. Indymedia Ireland glorifies Palestinian sniper Thaer Hamad (or Tha'ir Hamad), the killer of Israeli civilian settlers at Wadi al-Haramiya in March 2002. They approvingly embed this video by Tommy Donnellan who tells Hamad's family they should be proud of him. "You should be proud that you have such a brave son, such a courageous fighter" says Tommy Donnellan to the father of the Jew-killer. Thaer Hamad killed 7 soldiers, and 3 civilians: Sergei Birmov, 33, Vadim Balagula, 32, and Didi Yitzhak, 66. Incredibly, instead of executing him, the Israelis have him in jail. The Fatah Al-Aqsa Martyrs Brigade (who have carried out endless direct attacks on Jew civilians, including direct attacks on women and children) claimed responsibility for the attack. Yet the Indymedia article idiotically claims that Hamad did not want to kill civilians. Tommy Donnellan posted the video to YouTube with this write-up openly supporting the Islamic terrorist sniper. He repeats the absurd story that the sniper, who shot civilians dead, spared civilians. Note also the praise for the kidnap of Gilad Shalit. Some kuffar really admire the jihad against the kuffar! One man emigrating is another man 'fleeing', Galway "One World" Centre, November 29, 2007. These pampered western leftists, who have known nothing but freedom all their lives, actually defend Castro's policy of denying freedom of movement, and laugh at those who risk their lives to escape communist rule as "emigrants". They quote some lackey of the regime who they hosted in Ireland. Why did they not host a Cuban dissident? "The crumbling buildings in these barrios demonstrate the high price that years of sanctions have exacted from the people of Cuba." Not the high price that communism has exacted from the people of Cuba. Her film The Day Diplomacy Died (2010) actually defends Castro's 2003 crackdown on dissidents, journalists, human rights activists and democracy activists. Shame on her. Bob Geldof's sister Lynn Geldof liked the non-democracy of Cuba so much that she lived there from 1985 to 1989. Of course, unlike the Cuban people, she was free to leave at any time. The Cubans: Voices of Change by Lynn Geldof (1992). Publishers Weekly review says she "takes a distinctly sympathetic stance toward the Cuban state ... Most of the 19 people interviewed in Cuba announce support for the revolution ... In the preface, Geldof likens Cuba's history and geopolitical situation to that of Ireland and says that Cuba's social achievements are impressive compared with those of its Latin American neighbors." Irish Times journalist Conor Pope defended Che Guevara in an article in the Irish Times, 9 Aug 2012. T-shirt from here sums up the real Cuban revolution. After the mass-murdering dictator Castro died in Nov 2016, Ruair� McKiernan was one of those engaging in "whataboutery". Here he claims that Guantanamo was worse than Castro's Cuba. Guantanamo Jihadis. 0 This is worse. Ruair� McKiernan, 26 Nov 2016, says that before criticising: (a brutal tyranny that he likes) we should distract ourselves by looking at: (another country that can be criticised). See also Ruair� McKiernan on the Halawa case. 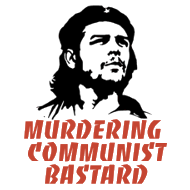 Irish travel writer Dervla Murphy (born Nov 1931) also supports communist Cuba. Her 2009 book on Cuba is called "The Island That Dared" - as if being an oppressive, unelected dictatorship is something exciting and unusual in this world. I was fascinated to discover that during WW2, when she was age 12, in Mar 1944, her family gave refuge to Nazi collaborator Charlie Kerins for several weeks when he was on the run, at the height of the Holocaust. He was IRA Chief-of-Staff 1942-44, when they were allied with (and assisting) Nazi Germany. He was on the run after killing a Southern Irish policeman. Extract from Dervla Murphy's book A place apart (1979 edn), recalling how she and her family sheltered the Nazi collaborator Charlie Kerins in 1944. In the 1978 edn the story is on pages 15 to 23. In fairness, she discusses the moral dilemma of sheltering a cop-killer. She does not discuss the moral dilemma of sheltering a Nazi collaborator. The Irish Examiner, 9 Feb 2012, prints an Israel-bashing article by Dervla Murphy. It is framed with an emotive anti-Israel picture that may be fake: "A spokesman for the Israel Defense Forces, Capt. Eytan Buchman, says that the man wasn't run over. 'After claiming to be injured, he was inspected by both an IDF medic and a Red Crescent medic, both who determined that he required no medical care whatsoever,' Capt. Buchman said." Scan from Rob Harris. See full size. Why are young people attracted to these ideas? I can remember being young and finding this kind of stuff convincing. In the 1980s I was pro-CND. In other words, pro leaving Europe defenceless against Soviet plans. Luckily, CND failed and the Soviet aggressor was stopped. I was never stupid enough to be consciously pro-Soviet, but I remember being pro-Nicaragua, pro-Libya, pro-Palestine, pro-Cuba. And of course anti-Reagan, anti-Thatcher. I look back now with embarrassment. Though I guess at least I've learnt something from it. The mind of the left - Why are we attracted to leftism when we are young? Return to The Irish left. Politics Religion Politics feeds Religion feeds Maps Since 1995. Banned in Iran: This site is banned in Iran. Blocked on Twitter: I am blocked on Twitter by Sarah Abdallah and Ali Abunimah and Nadeem Ahmed and Lexi Alexander and Umar Al-Qadri and Mo Ansar and Frankie Boyle and Brendan Ciaran Browne and CAGE and Allan Cavanagh and Tom Clonan and the Clonskeagh mosque and Stanley Cohen and Juan Cole and Ruth Coppinger TD and John Cusack and Cllr. Paul Donnelly and Alaa Abd El-Fattah and Cllr. Enda Fanning and Mary Fitzgerald and Tara Flynn and George Galloway MP and Roxane Gay and Harry's Last Stand and the IPSC and Charles Johnson and Owen Jones and Joanna Kiernan and Andy Kindler and Carlos Latuff and Frank McDonald and Rob McDowall and Ruair� McKiernan and Philip Nolan and Colm O'Gorman and Donal O'Keeffe and Aziz Poonawalla and Angela Rayner MP and Mubin Shaikh and David Sheen and Richard Silverstein and Jonathan Sugarman and Vian Tahir and Ronan Tynan and Mick Wallace TD and Ben White and Sarah Wilkinson and Asa Winstanley. What a shower. The reactionary part of the Islamic world, and their western allies, the regressive left. Who I block: I will debate almost anyone. I love ideas. I will not debate (and will block) people who: (a) target my job, (b) target my appearance, or: (c) libel me (such as call me racist). I will not debate such people. I will block them.